In order to keep pace with never ending demands of the customers, our company is instrumental in offering Coir Cricket Mat. We are the leading organization in the market to offer the best quality range of Cricket Coir Mat. - Cricket Synthetic Pitch thickness 4 - 5 mm. - Synthetic Pitches can be provided in widths 10ft. - Standard length is 100 ft.
- As far as the life of the Mat is concerned, there is no particular time and depends whether you use it Indoor or Outdoor. In case of Outdoor, it will should last for 1 year and if used Indoor can last for 2 years or so. 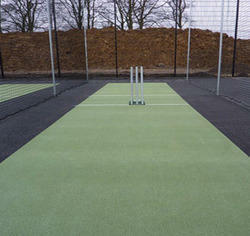 We have gained a remarkable position in the market that is involved in offering Coir Cricket Matting.